Prices for DRAM and NAND flash memory chips shot up Monday in the wake of Japan's earthquake and tsunami as markets displayed concern over fabrication plant shutdowns, power outages and supply chain shortages. 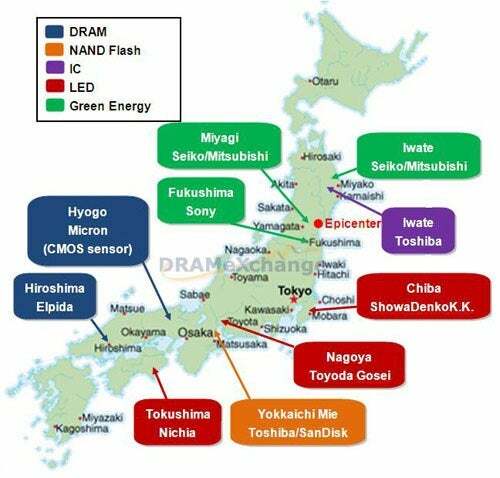 Japan accounts for 35.7% of the world's NAND flash production and 13.6% of DRAM, according to DRAMExchange's parent company, TrendForce. According to a survey of IT supply chains by TrendForce, chip fabrication facilities have been "seriously" affected by the 8.9 magnitude quake and subsequent tsunami. As a result, Japan faces major obstacles to an economic resurgence, the company said. For example, Shin-Etsu Semiconductor and SUMCO have shut down production in their silicon wafer fabrication facilities because of equipment damage and power outages. Shin-Etsu Semiconductor is a major silicon wafer supplier to memory manufacturers Elpida and Toshiba. Toshiba's NAND flash production has experienced only a "minor setback," according to DRAMExchange, but because of the impact on traffic and supplies of raw materials, Toshiba is still evaluating the consequences. "Due to its close proximity from the epicenter, the production in Iwate Prefecture will be affected severely; the memory production plants in Kansai area are with minor damage," DRAMExchange stated. TrendForce cited ongoing problems at nuclear power plants, including the shutdown of Fukushima 1, Japan's primary plant. "The residents near Fukushima 1 Nuclear Power Plant have been evacuated. Additionally, Unit #1 and Unit #3 of the plant have been infused with Boric acid, so these two units are now completely obsolete," it said. "The power supply of northeastern Japan has become a huge issue," TrendForce stated. "As a result, the supply for silicon wafer will drop significantly, which will cause the global semiconductor players outside of Japan to compete for material." On Friday, semiconductor market research firm iSuppli voiced similar concerns that silicon wafer production would suffer in the aftermath of the earthquake and tsunami. NAND flash memory makers Samsung and Hynix have stopped providing price information for the spot market. Samsung is the world's largest supplier of NAND flash chips. Spot prices for NAND flash and DRAM in China have also started increasing because the supply is likely to be affected, TrendForce stated. Toshiba and SanDisk's two major fabrication facilities, Fab 3 and Fab 4, are 800 miles away from the earthquake's epicenter, and production at those sites was described as "delicate." According to SanDisk's official statement, production was stopped temporarily and no employees were hurt in the quake, TrendForce said.